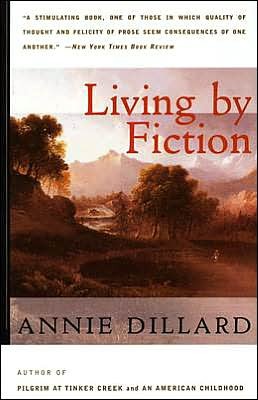 Living By Fiction by Annie Dillard. Harper Perennial. 192 pages. 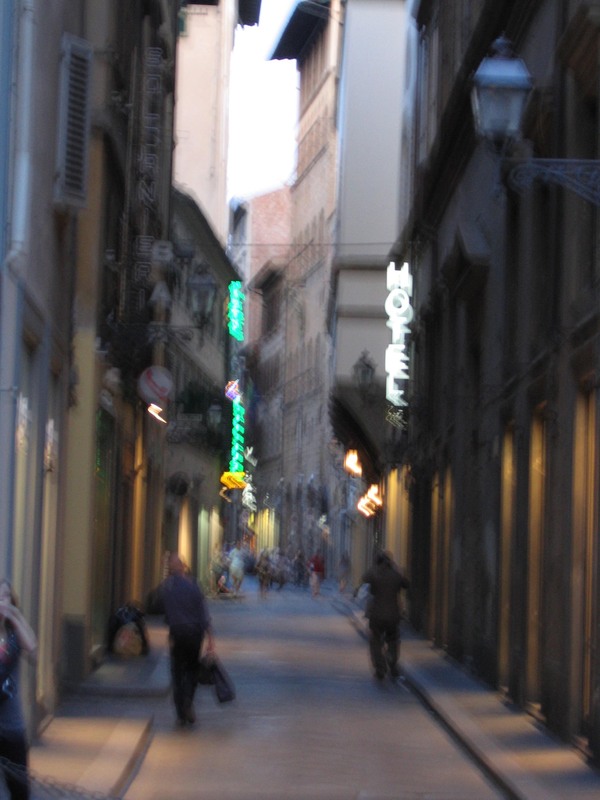 The cultural assumption is that the novel is the proper home of significance and that nonfiction is mere journalism. This is interesting because it means that in two centuries our assumptions have been reversed. Formerly the novel was junk entertainment; if you wanted to write significant literature—if you wanted to do art or make an object from ideas—you wrote nonfiction. We now think of nonfiction as sincere and artless. Perhaps this has changed, in part due to her own work, since Annie Dillard first published Living By Fiction in 1982. She might have called it Living by Literature because although it’s about her love affair with reading fiction in particular, she says more about nonfiction in a few asides and by implication than some books entirely on the topic. Her categories of “traditional” and “contemporary modernist” approaches, of “fine” prose and “plain” prose styles, cross genres as well. In fact, Living by Fiction enabled me better to appreciate and to understand David Shields’s less coherent Reality Hunger for what it is: a modernist’s aesthetic. After you have performed or read a detailed analysis of Eliot’s “Four Quartets” and Stevens’s “Comedian as the Letter C,” why would you care to write fiction like Jack London or Theodore Drieser’s? Contemporary fiction writers may be more influenced by Pound’s criticism than by Joyce’s novels, more by Stevens’s poems than Kafka’s stories. In style their work more closely resembles “The Waste Land” than Herzog; in structure it more closely resembles “Thirteen Ways of Looking at a Blackbird” than The Naked and the Dead. This strand of contemporary fiction has purified itself through the agent of criticism; it has adopted the brilliant virtues of Modernist poetry, whose bones are its beauty. Of course, she allows, modernist poetry has, like such visual art, pretty much evaporated its audience as well. In any case she takes pains for readers to understand her categories by grounding them in literary and artistic history. With modernism, representative storytelling in prose and paint became secondary: “each was considered for centuries the irreducible nub of its art, and is no longer.” (Yet the bulk of nonfiction remains representational, which may be why “we think of it “as sincere and artless.”) What is modernism? It’s not a mirror or a window on the world, Dillard says, but is characterized by the shattering of the narrative line, by collage. The juxtapositions and work’s surface are the point. Among her own works, certainly For the Time Being (reviewed previously) is modernist narrative collage. In it, she writes about birth defects, sand’s formation and ubiquity, China’s buried civilizations, clouds, numbers, Israel, random encounters, thinkers, and torture, and she makes the subjects cohere: her own obsessions with mortality and evil unify the work. 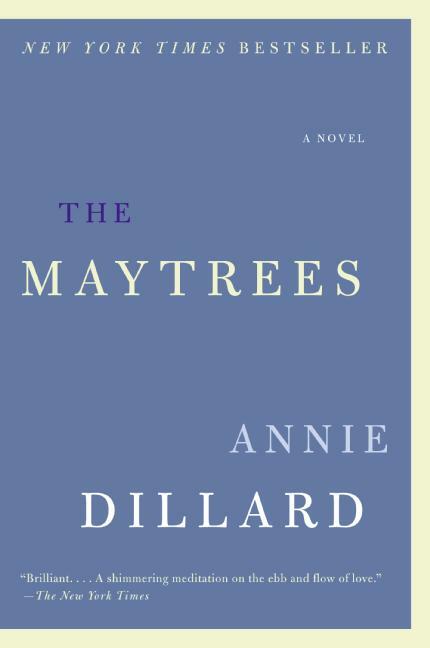 Her latest book, and avowed last, the novel The Maytrees, is a shimmering work of art whose love story is told as if by a coolly distant modernist God. And each sentence of it is distilled into poetry. Which brings me to her categories of fine and plain prose styles. Think of William Faulkner as the apotheosis of the former and Ernest Hemingway as the exemplar of the latter. Fine prose is showy and rhetorical, while plain is snappy and visual. The great prose writers of the recent past, until Flaubert, were fine writers to a man. A surprising number of these—those I think of first, in fact—wrote nonfiction: Robert Burton, Sir Thomas Macaulay, Ralph Waldo Emerson, John Ruskin, William James, Sir James Frazer. . . . I think fine writing in fictional prose comes into its own only with the Modernists: first with James, and with Proust, Faulkner, Becket, Woolf, Kafka, and the lavish Joyce of the novels. If you’re having trouble placing your favorite author on Dillard’s traditionalist-modernist or plain-fine continuums, remember Dillard’s dictum: most writers work in the middle. There’s much more in Living By Fiction, especially regarding criticism, which Dillard views as the modern “focusing of the religious impulse.” The making and interpreting of art, she implies, may be our last clear purpose left here on Earth. At least she expresses the view that, of human intellectual activities, art still produces and retains holistic meaning, and she holds faith that we may discern it. I prefer “distilled” to “evaporated.” But I get your drift, comme on dit. Gottcha. What WOULD the word be to go with her bared bones. I suppose the flesh could be distilled, then evaporated, but . . . flayed or butchered? It gets pretty violent in any case! As an audience member, I wouldn’t want any of them done to me. I suppose desiccated would work, for her purposes if not for mine. . . I wonder what her purposes are: I don’t think she meant that comment as critically as it sounds, even in my paraphrase, which is pretty close to her words. She is a fan. And she has written a fair bit of poetry herself, she began as a poet, and I have enjoyed what I’ve read by her. What a beautiful essay you have written here, Richard. You’ve revealed new nuances in modernism and postmodernism to me. I’m an admirer of the plain style myself, but I am also slow reading Nabakov’s Speak, Memory and am amazed by his dazzling prose style. Annie Dillard is one of my favorite writers. You always delight and inform me with your posts. Thank you. Wonderful essay. I’m not a huge fan of Dillard’s–one of the few, I’m sure–but I like to keep up with what she’s doing. Won’t need to buy the book now. Daiva, Maybe she is an acquired taste? I had a writing mentor who loved her and so I began to read her. I have not been able to get through Pilgrim at Tinker Creek, though; or at least when I skimmed it a few times I bounced off . . . I couldn’t get through Pilgrim Creek either. I was thinking of writing a parody called Pilgrim at Deer Run Subdivision. I’m surprised she hasn’t been parodied more. I was able to get through other books of hers, but I think you’re right–she’s an acquired taste. Daiva, Have you tried The Maytrees? It is distilled to an extreme, but a beautiful story and lovely prose. Thanks, Richard. Maybe I’ll give it a go.